Over the last two years, one of my great pleasures in working in the back of house has been in seeing the process of installation each artist undertakes right next to me, in the Front of House gallery. Saree Silverman’s new installation for this space has been fascinating in bringing home the work aspect of artwork, and in particular how much sleight of hand is involved in turning raw material, however humble, into something rich and strange. In Silverman’s case this process has been particularly alchemical, because something delicate and enormous and beautiful has been brought out of, well, just about nothing. 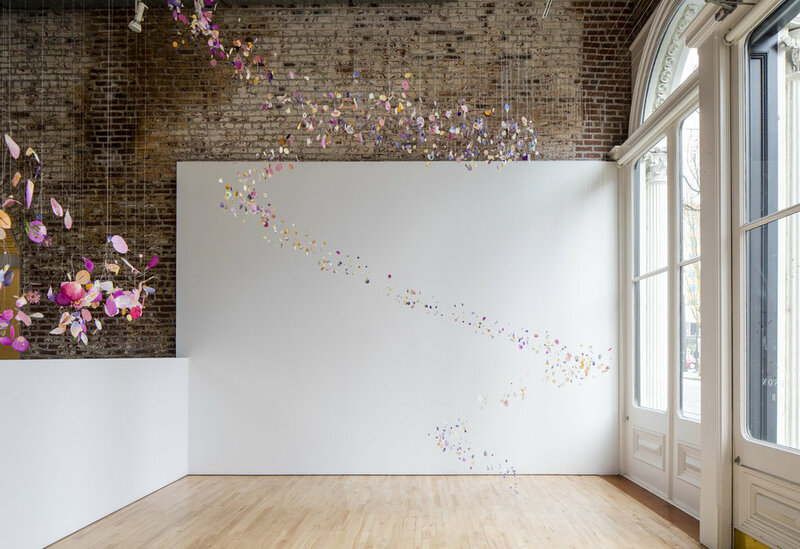 While the work of the office behind her proceeded in its noisy, fits-and-starts way, there was a kind of whispering, relaxed but very linear efficiency to the work of installing Aerial Garden. 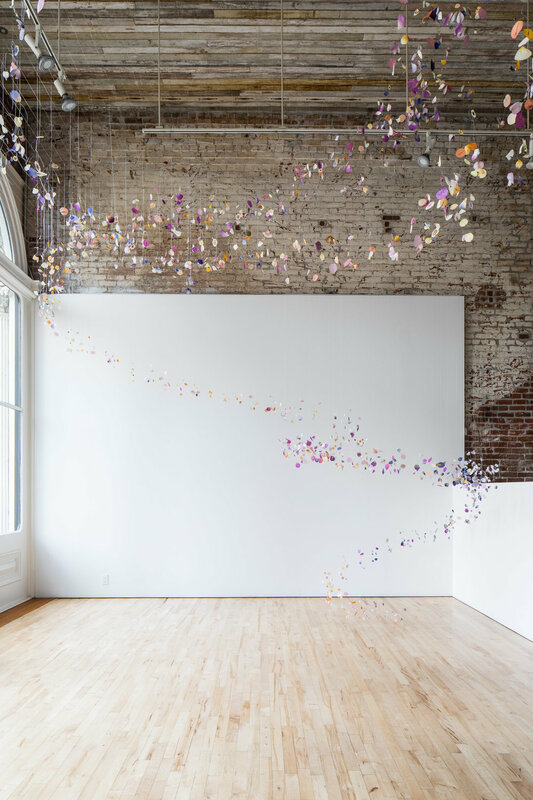 Out of her conjuror’s bag of dried flower petals, miniature leaves, and monofilament line, she and her assistants have called up a colorful tornado that strains up and swirls away from the bounds of the space that contains it. Silverman talks about her work being influenced by her experience of nature, and more specifically the study of collective behavior in swarms and flocks. She uses a word to describe her process which got me running to look it up: “stigmergy.” The term refers to the way in which very simple actors such as ants leave a trace of their path, which stimulates, informs, and reinforces subsequent actions by others and thereby creates a kind of emergent intelligence. Though there was clearly a plan and discipline to Silverman’s approach, I got the sense that her quiet and contemplative way of building up her installation was exploratory as well. Perhaps now, in retrospect, the apparent linearity of method I referred to before was just this emergent phenomenon at work, each mark suggesting the next and slowly giving form to this delicate, susurrating and exuberant flock of petals. Born and raised in the artificial, urban sprawl of Los Angeles, California I craved a more authentic, connected, deeper and meaningful life. I found these things through art and through a deep appreciation of nature. Simply put, my work seeks to capture the beauty in the world, in all of it’s nuances and complexities. When we see beauty in the natural world, it halts our hearts. It softens us, gives us perspective, clarity, and motivation to be a living reflection of that beauty. “When we value beauty, not as something to be manufactured, but as something to be lived, then we are able to take it in, celebrate it and pass it on in a meaningful way.” Whether it’s through print media, sculptures, installations or drawings the initial motivation for creation is reverie and the final intention for the viewer is enchantment. Saree Silverman received her undergraduate degree in Art and Design at the University of Michigan and is currently pursuing a Master’s in Fine Art, in sculpture, at Cranbrook Academy of Art in Bloomfield Hills, Michigan. Individuality and the totality are interwoven; nothing is separate or extraneous. My work is about this simultaneity, as I seek to understand what it means for each of us to exist as unique beings within an interconnected world. Frequent excursions into nature are my starting point. Years spent in the urban sprawl of Los Angeles led me to seek solace in the natural world. I am ignited by the feeling of expansion one experiences in the wilderness - the sense of transcendence that quiets one’s mental ambitions, swells the heart, and stretches the limits of belief and understanding. There, in communion with the natural world, I observe, sketch, and forage for materials to investigate. Whether I am composing a drawing or beginning an installation, one mark or manipulation leads to another and another until a larger system is formed. In this process I am reminded of harmonious systems; flocks of birds, schools of fish, bacterial colonies, even the emergence of cities, communicate and grow by one element responding to the next and so on and so forth until a bigger, more ”intelligent”, entity manifests. Therefore, spectacle is often employed to explore the idea of interconnectedness and interdependence of all things. Natural elements are used to create an awareness of the temporal and fragile nature of our lives. 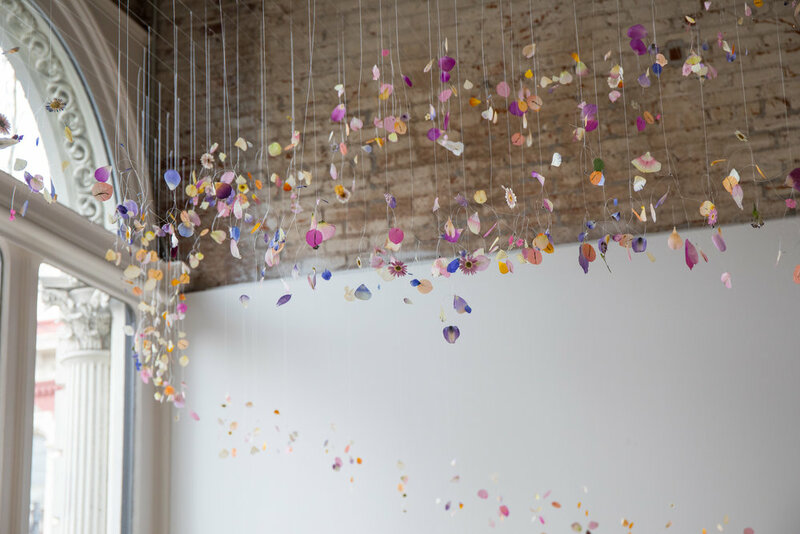 Aerial Garden combines Native American folklore, botanical symbolism, and, to celebrate a more conscious way of being in relationship to the world, one that honors an individuals place in a larger interwoven system; one that is soft yet strong, quiet yet powerful, and also serves as a reminder of the inherent beauty and wonderment in the world.